When it comes to Expo 2015, Milan seems to be unaffected by the economic crisis. Giovanna Dunmall describes the event as ‘an extravagant temple to consumption, waste and the corporate dollar’. 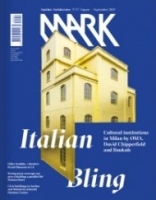 However, at the same time, Expo 2015 was the perfect opportunity for other cultural institutions to open their doors, three of which are highlighted in Mark #57.